It is often said that good tool choices make a great craftsperson. As with all other media, that axiom is as true when learning how to draw with coloured pencils. The selection of the right tools, in this case, your pencils of choice or the paper you will use can have a tremendous impact on the results of your efforts. Coloured Pencils are probably the medium I struggled with a great deal when I started out, as information were few and the Internet hadn't a lot of information at that time. And yet, it became the medium I used predominantly within the 15 years I worked as a commercial illustrator before I turned to teaching. That is why I emphasise in instructing my students on the tools available for this trade and provide information they need to make sound decisions when choosing the right pencils for their masterpieces. While the traditional black graphite-based lead pencil was produced in 1564 with the discovery of graphite in England, historians believe that it was not until the 19th century that pencils with colouring properties were available. However, archaeological evidence shows that waxed-based colouring was popular even before then, amongst the ancient Greek and Roman civilisations. It was in 1834 that German entrepreneur and inventor Johann Sebastian Staedtler came up with his first oil pastel-based coloured pencils. Seeing how well liked these unique drawing tools were, others soon jumped into the business of producing colouring pencils, including the (now famous) Faber-Castell family, who rolled out the very first set of colouring pencils specifically for artists in 1924. Today, brands like Caran d”Ache, Progresso, Derwent and Lyra Rembrandt are popular amongst teachers and students at pencil-based art classes and studios across the world. Today we have three types of coloured pencils available to us, wax-based, oil-based and water-soluble. Both wax and oil based coloured pencils are almost identical in their application, except for the wax bloom that is caused by wax rising to the surface when laden layers of pencil have been administered. Those layers can be easily removed with some fine tissue. The use of pencils, whether coloured or black/white, as a form of art expression has long been a matter of personal preference, even among master artists over the centuries. Some of the most memorable sketches of Leonardo da Vinci were created using nothing but pencils and graphite. Where images created from watercolours and paints require time (sometimes measured in hours!) to dry out, coloured pieces of artwork created from pencils don’t need such thawing. It enhances the vital skill of drawing, which beginners who advance too fast into painting usually lack. It is easier for a genuine drawer to learn painting, than for a good painter to learn drawing. ​Because of these inherent properties, learning how to draw with colour pencils is far more practical than starting out with paints and watercolours. If you do make a “mistake” on your pencil drawing or sketch, it’s far easier to “undo” compared with other mediums. Although often seen as a kids tool, coloured pencil artwork can be almost indistinguishable from photographs or other forms of artistic expression. The "Color Pencil Picker" is the newest and most beneficial app for any coloured pencil artists. No matter your subject, once you taken a photo of what you want to draw or use an existing image that you already have on your phone, the app can pick the exact colours you should use from the brand and amount of colour set you own. Not only that, you also have the option to choose the number of pencils you have in your set. For example, for the brand Derwent Artist your choices are between the 36, 48, 72 or 120 pencil sets. There is free and a pro version. As alluded to earlier, there are a vast array of popular manufacturers that produce colouring pencils today. So, how does one distinguish which one is best? Well, simplistically speaking, which brand you choose should depend on the purpose of your art project. Waxy formulated: These are wax-based colouring pencils and as such, provide a creamy, smooth feel while artists use them. Best for highest lightfastness (LF) rating: Lightfast ratings determine how quickly your masterpiece will deteriorate when exposed to light. These pencils rank higher on the lightfast scale, which means you and others will enjoy your creative work for a long time to come! These pencils are exellent for both the layering and burnishing techniques. Waxy formulated: These are produced from a wax-based formula, and when used correctly leave no traces of smudges, with markings dissolving with not much effort. 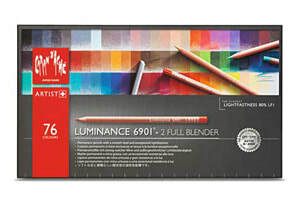 Best for blending and shading: With the highest lightfastness ratings, this is a great choice for coloured pencil art classes focused on shading and blending. Vibrant colours: Considered as one of the highest quality in watercolour-based pencils, they come in vibrant colours that can be easily matched across their colour index. These pencils are brilliant for the burnishing technique but also satisfactory for layering. Harder, hence much clearer detail: Since they are firmer in composition, they can be sharpened to a finer point, allowing you better control over fine detail. The hardness means you can apply more pressure without fear of the pencil crumbling on your drawings. Due to their solidity it the perfect pencil for the finest and smoothest layering techniques but not befitting the burnishing technique. Not as bright as other brands: With most of the coloured pencils in this series carrying an LF rating of between 3 to 4 (the earth colours are rated much higher), these are somewhat less bright than many other brands offer. Many students are confused about the quality of the studio and artist pencils. Usually student quality means a lower grade than the artist brand, but we are talking about studio quality here. The studio pencils were initially created for graphic designers working on a slanted drawing table, but are not different in standard from the artist quality option. Questionable lightfastness: While most of the colours in this series are lightfast, producing bright, vibrant outputs; some of them aren’t too high on the LF-scale, making them a questionable choice as far as lightfastness. If you are primarily fixated on LF-ratings, you should look at other Prismacolor products with higher LF numbers. Suitable for beginners: These pencils are super soft, delivering a waxy finish like that produced by B-grade graphite pencils. If you are just a beginner, learning how to draw with colour pencils, then this might be the pencil of choice for you! These pencils are best for burnishing techniques and less suitable for extremely fine detail layering. 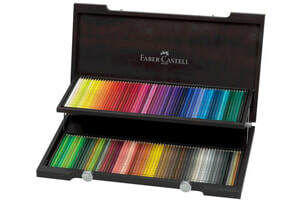 Suited for almost all colour pencil techniques: Part of the company’s artist-grade offering, these are oil-based and feature rounded coloured pencils made from high-quality cedar casings. Break - water - smudge proof: As oil-based pencils go, these produce an intense colour that offers great blending properties, even without the use of blenders. You also have excellent grey-scale choices and provide heavier warm tones like yellows and reds. They are durable, and less likely to break, either when sharpening or during transportation. 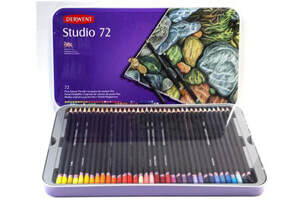 When being introduced to coloured pencil art classes, you’ll learn that there are two primary techniques for using these tools, layering and burnishing. You first use your pencils to produce layers of primary colours so that you create your future masterpiece in various tones. Then, you either continue layering or start burnishing further layers using lighter-coloured pencils or finish off with colour-less blenders. Your choice of pencils will, therefore, depend on what you intend to accomplish. between oil based and wax based coloured pencils? Every coloured pencil is manufactured by mixing pigments and binding them, the better the quality the more pigment and less binder. To bind the pigments either was or oil is used and both have their pros and cons. 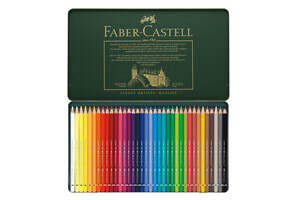 such as Faber-Castell Polychromos, Lyra Rembrand Polycolor and Koh-O-Noor Polycolor. More suitable for layering techniques than wax based pencils. More break resistant than wax based pencils. Colours are quite less intense than those with wax. They are harder to blend than wax based pencils. such as Caran D'ache Luminance, Derwent Studio & Coloursoft, Prismacolor both Premier and Verithin. The are in most cases far easier to blend. Can produce was bloom, as whitish film that is produced by too much wax that rises to surface. Break easier than oil based pencils. Run down much faster than oil based pencils. When it comes to picking the apropriate coloured pencils for the right use, all art students struggle with making the right choice. That is why we focus on initially equipping students with the necessary knowledge to make those tough decisions. So, if you are planning to join art classes in the near future, which one of these brands should you choose for your coloured drawings and sketches? As indicated earlier, the choice of a label depends on the end use of the pencil. Choose Caran D'ache coloured pencils if you value the ability blend and burnish your work in brilliant hues, mainly if you are working on 3D images. Faber-Castell Polychromos is a fabulous choice if you are looking to create works of art with vibrant pigments; or if your end results require richness of saturated tones. 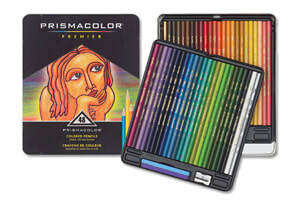 If you are a complete beginner, then drawing with pencils from Derwent or Prismacolour Premier might be your choice. These offer a great assortment of muted palettes and are great for blending and shading applications too. And for those of you that are just wanting to relax doing colouring books may want to give the Prismacolor Premier a try, as they are also light on the budget. Art Classes are brilliant for learning how to draw with coloured pencils because you will learn so many shortcuts which have a tremendous impact on coloured pencils drawings and because a good curriculum provides students with a very firm grounding of the basics. Coloured pencil art classes or workshops will prepare you well for the future. As a result, and I am thrilled seeing my students flourish and overcome the most common mistakes and addressing colour pencil projects more professionally as sufficiently.